My friend, Sue Aquila, a triathlete and coach at Endurance Corner, wrote the other day to share a story about Cheryl, another of her triathlete/swimmer friends….one with an interesting story about swimming a PR while having a heart attack! Cheryl was kind enough to share her story here. I’ll add a few thoughts at the end. I shared my story at the W3 reunion two weeks ago, and am sharing it here as my public service announcement. I am a 46 year old white female. I have never smoked. I exercise every day; some days twice a day. I eat a healthy diet (not a perfect one, but a decent one). For years, my cholesterol hovered around 200, no matter how I changed my diet. I have no family history of heart disease. I was a competitive swimmer from age 5 through college. Then I slowly took up triathlon. I have always been very physically active. On March 2, I had a minor heart attack. Heart disease is the No. 1 killer of women, and is more deadly than all forms of cancer combined? Heart disease causes 1 in 3 women’s deaths each year, killing approximately 1 woman every minute? An estimated 43 million women in the U.S. are affected by heart disease? Ninety percent of women have 1 or more risk factors for developing heart disease? Since 1984, more women than men have died each year from heart disease? The symptoms of heart disease can be different in women and men, and are often misunderstood? While 1 in 31 American women dies from breast cancer each year, 1 in 3 dies of heart disease? Only 1 in 5 American women believe that heart disease is her greatest health threat? 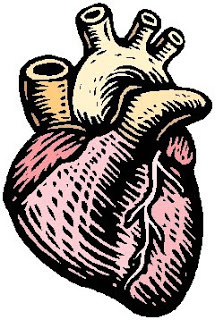 Women comprise only 24% of participants in all heart-related studies? On March 2, I went to a masters swim meet. As I was warming up, I stopped when I had this terrible pain in both arms and my shoulders and chest. As I tried to process this, my first thought was I must have really pulled my pec muscles when I did that 25 sprint fly, probably wasn’t warmed up enough. But I have felt muscle pains/strains and this was vastly different. So I thought maybe I compressed a nerve in my neck (in 1999 I had an accident that caused some traumatic injury to my neck, so it is a frequent cause of problems for me). I tried to swim easy, hoping it would go away. It did not. I raced three events anyways in terrible pain. During the three hours I was at the pool, I cried to myself, but felt like a whiner complaining about it. After three races, I told my husband I had to go home (it was a two hour drive, I was sooo thankful he was with me, I don’t think I could have made it home on my own). The pain persisted all day with no change. I took a mega dose of Aleve and went to bed, and woke up feeling quite a bit better. I walked my dogs in the morning, and within minutes the pain returned. Again, my first thought was muscle issue, as my dogs are big, and maybe I just re-stressed an already injured muscle (little did I know the muscle I was injuring was my heart). Still in denial about a heart issue, I went to my chiropractor, and she ruled out a nerve or disc problem. I spent 4 more days doing nothing but wondering why every time I started walking for more than a minute, the pain returned. On Friday evening, I finally wised up and called a neighbor who is an R.N. He told me I had to see a doctor, that it most certainly could be my heart. I considered waiting until Monday and calling a doctor, but saturday morning my anxiety was at an all-time high. I broke down and went to the E.R. Their first question to me, “are you here for chest pain?’ When I answered yes, they went into fast action. I had an EKG and blood tests. The blood test looks for an enzyme called troponin. If troponin is found, it indicates that there was a cardiac event. It takes a week or more for troponin to slowly go away and after 6 days, I still had some. A CT scan ruled out a pulmonary embolism. A cardiologist came to talk with me. Coincidentally, he had been a swimmer, and seemed almost happy to be able to help me, as he didn’t have to rake me over the coals for being overweight, or a smoker. Based on my story of the Sunday incident and the rest of the week, my current symptoms, my blood test, and my lack of family history of heart disease, he was pretty sure we would find blockage via a heart catheter. My BP was normal, my cholesterol 170, but LDL 100, so that number was higher than desired. Being Saturday morning, and living in a small city, their heart catheter doc is only called in on weekends, if the heart patient is in a state of emergency. I was not–as long as I was just sitting quietly. So I would likely wait until Monday. I thought I would go home. No! They made me stay. I secretly hoped that someone would have a heart attack that day that required the heart cath doctor to be called in, and 9 pm rolled around and just after my husband had gone home for the night, the doc popped into my room and asked me if I was ready for my cath. I nearly jumped out of my bed. Yes, please! So, the cath team went into action and had me prepped in no time. The heart cath involves insertion of a catheter into your femoral artery, they snake it up into your heart and look around the arteries with a camera. If they find a blockage that they think can be fixed with a stent, they attempt that. In my case, they found a 95% blockage in my right posterior descending artery. Fortunately, a stent was inserted, and the balloon expanded it, and the stent fit properly, the blood started flowing through the artery. Another 36 hyours in the hospital, and I was released. But not before I amused the staff walking the halls in my running shoes and hospital gown. A healthy heart attack patient gets back at it quickly. It’s been 4 weeks now. I’ve been slowly resuming easy exercise. My diet, while not bad before, is undergoing a major rehaul. Now that this has happened to me, I look at everything I ate before, and think of it now in terms of my heart’s health. I used to drink a lot of mile, and eat a lot of yogurt. Now, I will cut back, and choose skim milk. I am cutting back or cutting out foods with high cholesterol and saturated fat, even if I didn’t eat them often in the past, they are mainly going to be excluded. I am certain I won’t say no to every food that has some fat or cholesterol, but they will only show up in my diet on very rare occasions. Other signs, such as breaking out in a cold sweat, nausea or lightheadedness. Don’t assume, like I did, that because you are an athlete, that it couldn’t possibly be a heart attack. Every minute that some of your heart is deprived of oxygen, heart muscle cells are dying. Get your cholesterol and blood pressure checked regularly, and keep the numbers in the good range. Be wise about your health. Be smart about your heart. It sounds like Cheryl’s story has a good ending….she was eventually diagnosed and treated for her coronary artery disease. Good endings often depend upon prompt action, though. Don’t delay. If you have any concern about the possibility of a heart attack, seek medical attention promptly….and certainly don’t wait to finish the swim meet! The American Heart Association has a wide variety of helpful educational offerings about heart attack, coronary artery disease, and many other topics. Check out the AHA website especially for their Life’s Simple 7 program that guides individuals in 7 easy, concrete steps to safeguard their heart health. 1. Cardiac Arrest? Heart Attack? Heart Failure? Learn the differences between these heart problems. 3. Two Stories. Two Endings. Another couple athlete stories with coronary artery disease. I had the opportunity this past weekend to be Camp Director for a USAT-sanctioned weekend triathlon training camp hosted by our local triathlon club, the Mississippi Heat Triathlon Team. We had a terrific weekend of swim, bike, and run training along with educational sessions in each sport. The campers included more than 60 athletes of all ability levels and our program included a separate track called Triathlon 101 that was designed specifically for beginners. I thought I would share a story from the camp that highlights the importance of safety planning for such events. Our Sunday morning program included breakfast, an hour-long talk about run training, and then a group run. The athletes could choose among 4-, 6-, 8-, or 10-mile groups. We gathered outside in our various groups, each with a coach, had a short briefing about the run, and headed out. Within sight of the neighborhood clubhouse where we started, one of the campers, a 40-year-old man in the Triathlon 101 group, developed severe chest pain. He stopped and the pain gradually subsided over several minutes. Two of his fellow campers, who were both physicians, tended to him and he walked back to the clubhouse where plans were made to drive him to the hospital for evaluation. As it would turn out, he suffered a mild heart attack, underwent cardiac catheterization, was found to have a severe blockage in one of his coronary arteries, and was treated successfully with a coronary stent. He spent 2 nights in the hospital and is now making a good recovery at home. We shouldn’t be surprised that serious heart disease can manifest in the setting of a group of “healthy” athletes. Heart disease is common even in this population. Some take-home messages: 1. Planners of athletic events should be prepared to deal with heart-related medical emergencies. There should ideally be on-site medical professionals as well as easy telephone access to EMS, if needed. 2. It’s important to recognize that transient symptoms of chest pain or shortness of breath can be related to serious heart problems. 3. Even though there are many health benefits of exercise, athletes assume some finite risk of acute heart-related problems every time they exercise or train. This article at abc.net describes how an athlete in his late 40’s died of a heart attack during a canoe marathon event at the World Masters Games in Sydney earlier this week. Coming up, we’ll look at coronary artery disease, its risk factors (and ways to modify those risk factors), and its influence on athletes as they age. Stay tuned….